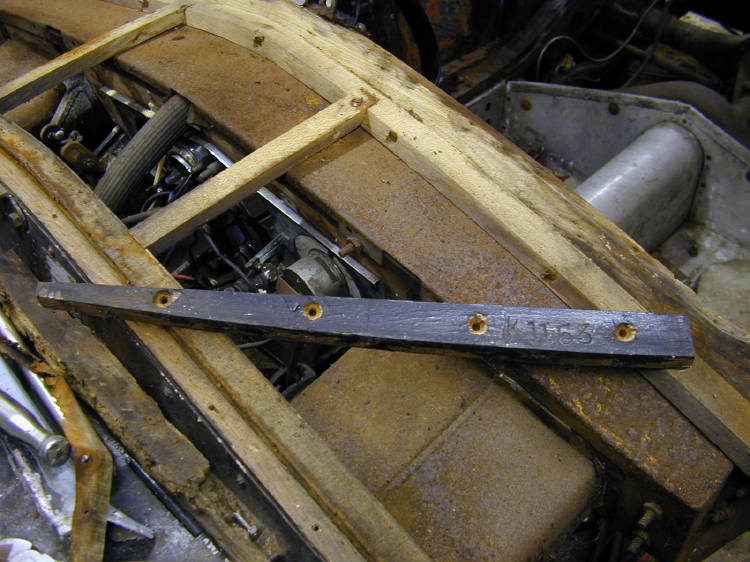 The body number stamped on the left hand bulkhead to 'A' post timber.This was in sound condition, so it was retained. 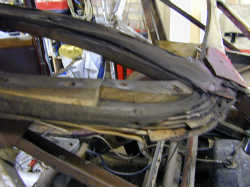 Right hand rear end - the ply gusset was the first piece of frame replaced. Bulkhead/ A post framing with bulkhead steel removed. Corner of roof over left hand 'A' post - a previous repair.to the cant rail and 'A' post. Deterioration of the nearside rear roof quarter. 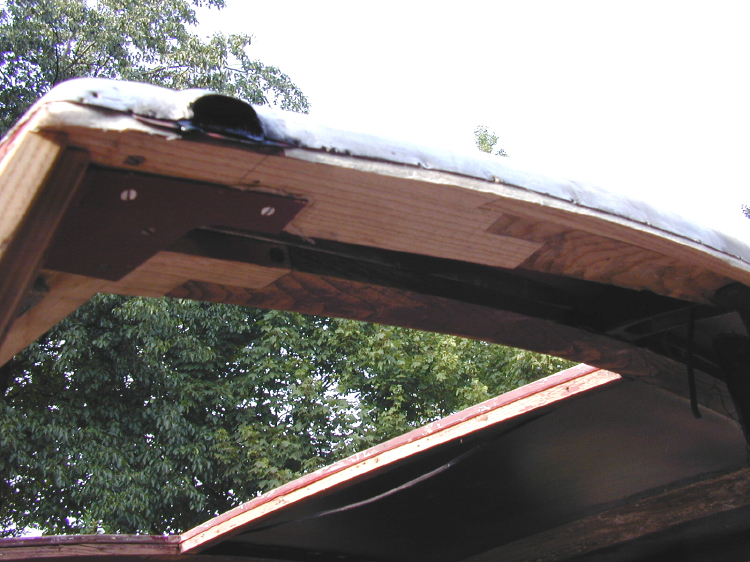 Note the calico tape placed between the timber and aluminium panel, and the thin rexine strip above the roof rail. Further deterioration round the nearside boot/ rear window. Repairs to the nearside cant rail and inner rail - screwed and glued. Right hand cant rail - repair in progress, showing aluminium template fixed to underside. The new timber can be seen adjacent. 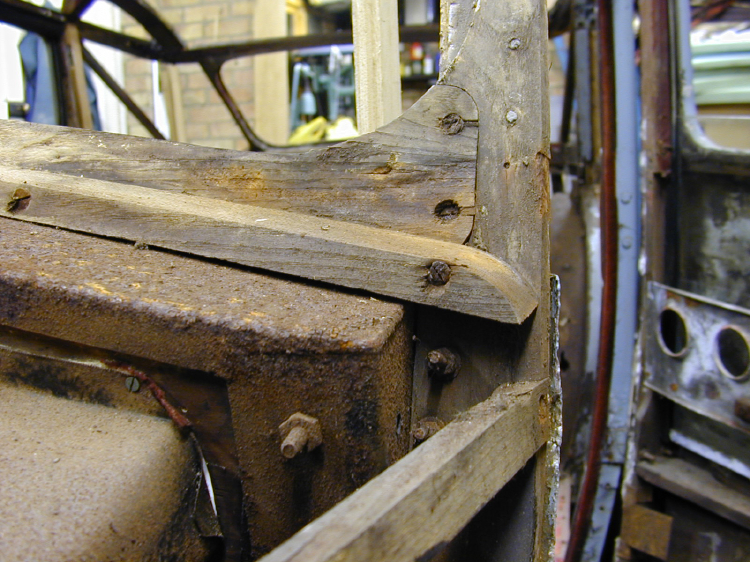 Offside 3/4 view - most of rear frame now renewed. New frame - offside rear boot area. 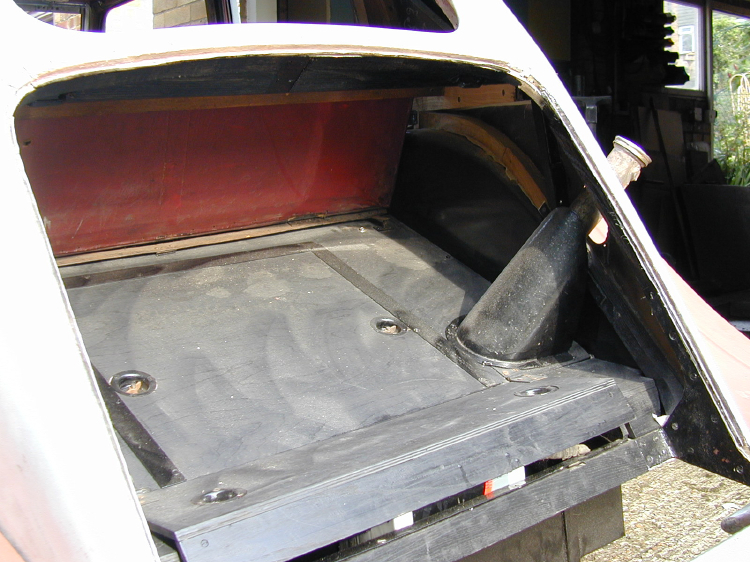 New frame - nearside top of boot opening. New frame - right hand 'A' post area. New boot framing with original aluminium panelling refitted. 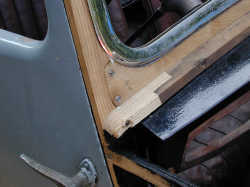 Detail - right hand side of windscreen showing repair to bulkhead panel support rail. Bulkhead toolbox shelf - showing original calico tape dressed around edge. Body panels refitted. The steel scuttle panel is new. 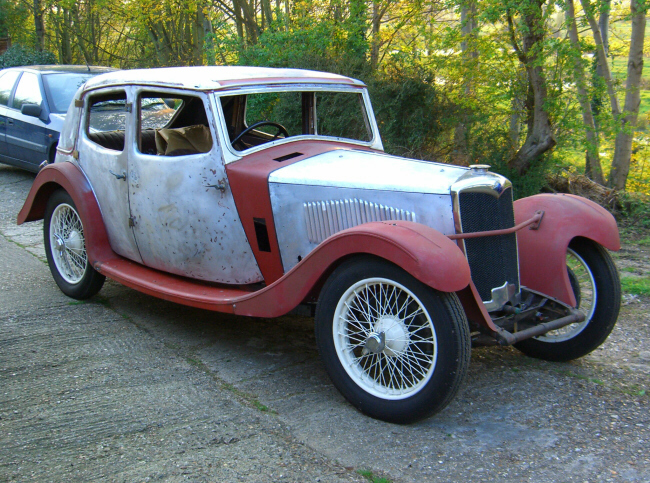 1934 Riley Kestrel '9' . Most published information covers mechanical details, while bodywork is dealt with in a comparatively superficial way. It is hoped this description will add to the pool of knowledge about this model in respect of the bodywork details. The work is ongoing, so the content will be updated from time to time. 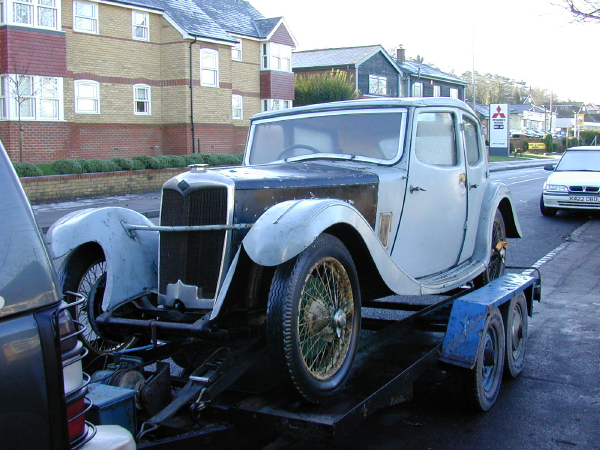 This car is a 1934 Riley Kestrel ‘9' with Special Series engine and manual all helical gearbox. It was acquired in December 2000 as a non runner. 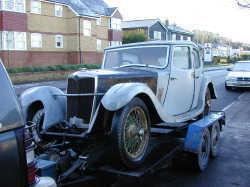 The car had been in storage unused for about 40 years. It was found to be very original but in need of complete restoration. 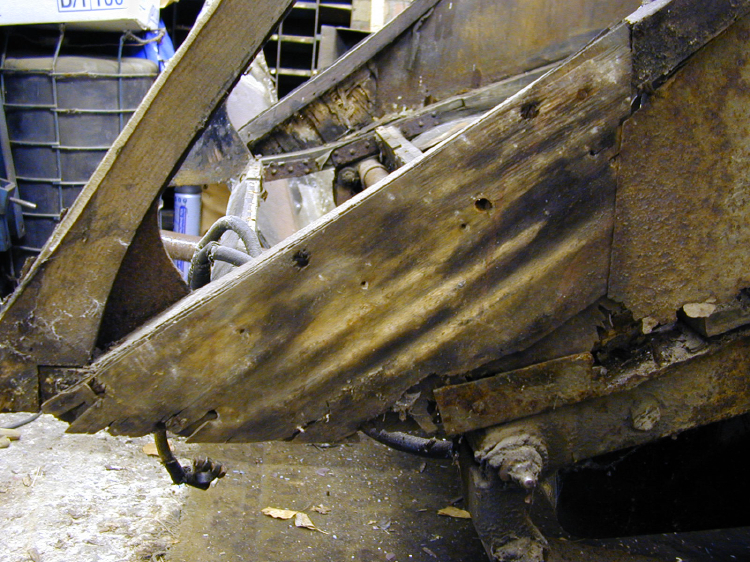 Much of the ash frame had deteriorated from natural aging and wet rot – particularly in the rear of the car. Most plywood panels were infected by wood boring insects and/or delaminated. So the body was held in place mainly by the aluminium panels. The chassis was basically sound but with all over corrosion - hardly any chassis paint being present. 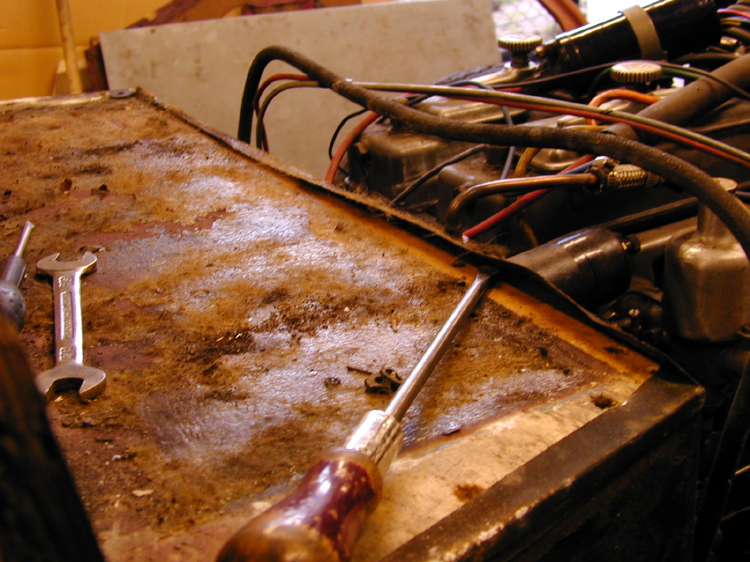 Some mechanical repairs were undertaken before commencing the main body repairs. It's much easier when the car can be manoeuvred under its own power. So a spare engine was fitted, ignition wiring renewed, and a new petrol tank was commissioned and fitted. It's also more satisfying to have a ‘live' car to work on. Renewal of the body frame. These remarks relate to the Kestrel. The sequence and details described does not necessarily apply to other bodies. I have previously rebuilt a similar ‘9' Kestrel, so I had some idea what to expect. My approach to body frame repair is to leave as much as possible of the original material in place on the chassis, so as not to lose the integrity of the shape. It is practical and more desirable to retain as many original timber members as possible. 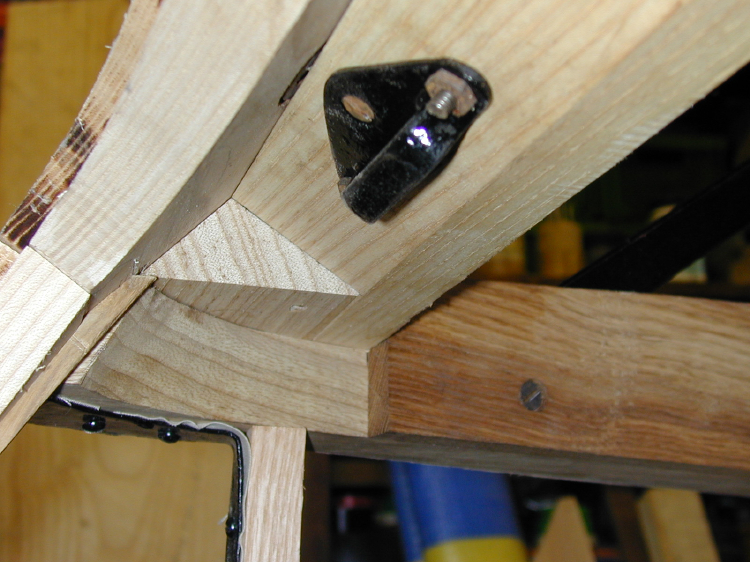 Partly defective components can be retained by carefully ‘letting in' new timber as a repair. In my opinion the fewer ‘improvements' or modifications introduced the better the end result. To this end I attempted to copy exactly in every detail, including fastenings, joints and their positions. Here and there I broke my own rule but generally it is a lot easier to produce a copy than to try to reinvent the wheel. 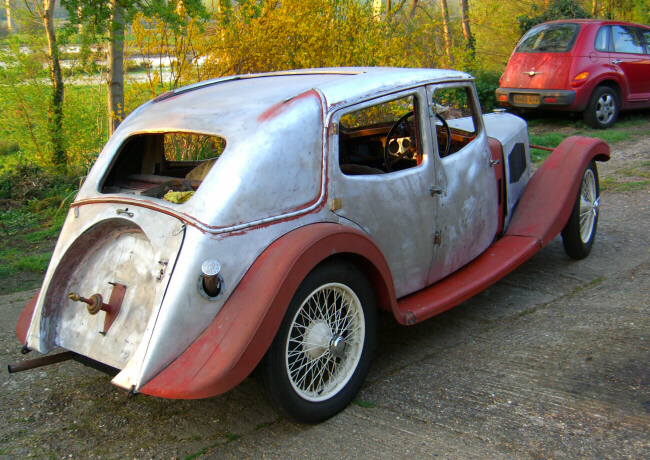 The main objective is restore the frame so that the doors, front and rear windows and the boot lid fit correctly with best possible clearance. Also there is the important matter of being able to refit metal panels exactly as they were before removal. Some allowance may be required for settlement of the body over its lifetime. Doors should not be dismantled until last as they provide excellent guidance for the correct body shape; nevertheless it is an advantage to remove the trimmings, glass and fittings to make them lighter for the frequent handling required. Record photographs and sketches provide valuable reference for all later stages. Profiles and measurements are recorded ahead of fabrication; these can be taken from the original component, or from its mirror part where available if that is in better condition. Adjacent components can also be a valuable source of information. For example, the rear doors can be used to generate profiles of the wheel arch timbers. I make rough profiles in paper or card; thick card can be obtained (scrounged) from printers, being of the type which reinforces packaging of cut paper sheet. Final profiles are then produced from thin ply or MDF. I made a full size former for the rear wheel arches made in the solid from chipboard; this was built up to the thickness required to serve both nearside and off side components. 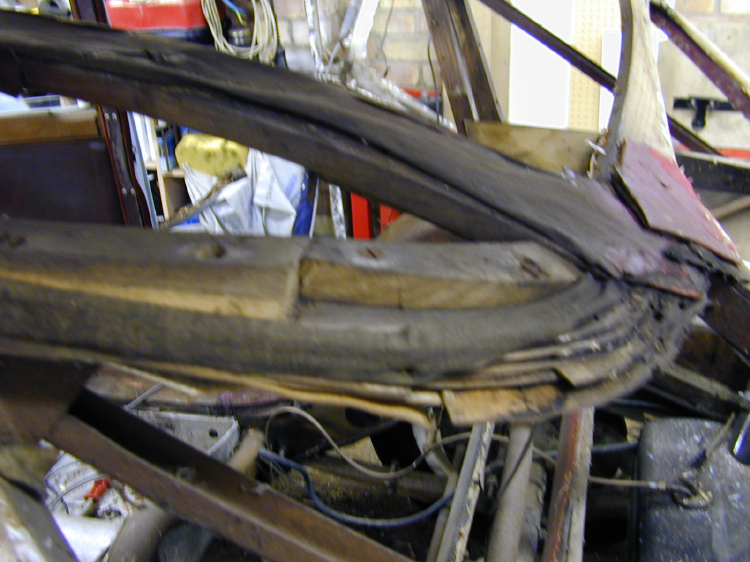 Apart from enabling an accurate pair of new wheel arches to be made, it also served to check the fabrication of the timber wheel arch members. Making profiles, formers and patterns is one of the most essential parts of the job; the more accurate the profile etc. the better the finished work. The first task is to carefully remove components which obstruct body repairs – wings, engine, front window, interior seats and fittings, etc. 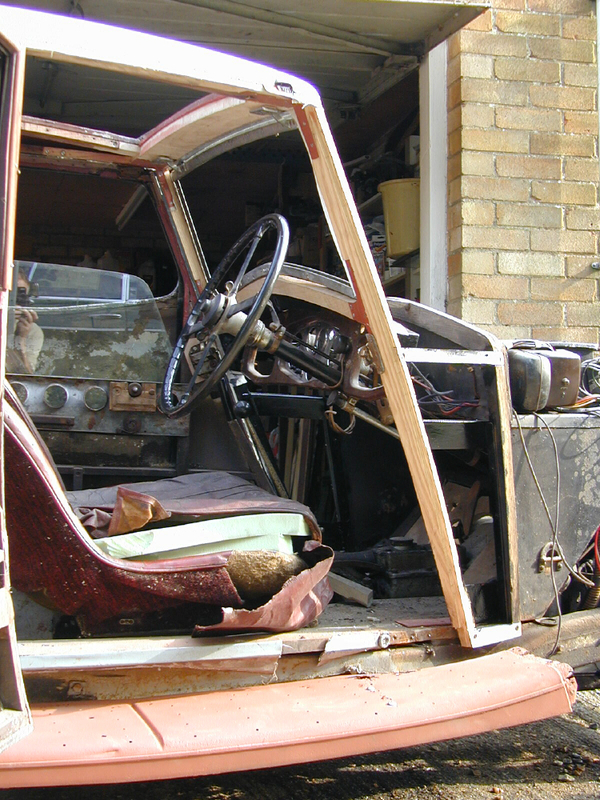 Then comes removal of the body ‘skin' components – guttering, roof panels, rear window and body fittings. The guttering is a ‘close down' section and is very difficult to remove intact. This section, or a very close match, is still available; so it is better to sacrifice guttering but avoid damage to the metal panel below. On the other hand the close down ‘D' cover section cannot be replaced and should be retained if possible. It is better to pull the nails through the base of the section, leaving the external profile intact; the section can then be annealed and reshaped for refitting later. When refitting I drilled new holes for nailing, with oversize holes in the profile for nail heads to pass; a tapered nail punch completed the nailing without damaging the profile, and the holes were then filled. 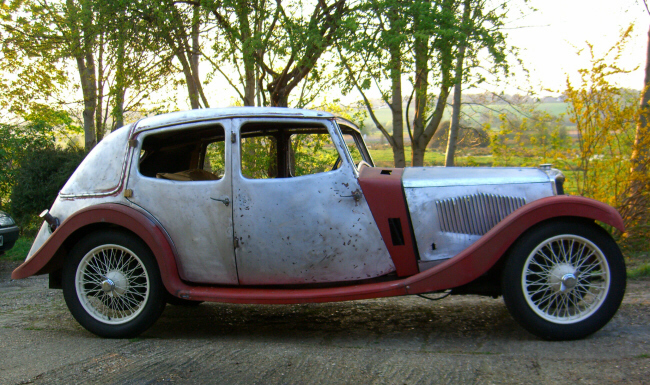 The wings and running boards were taken to be grit blasted and primed to preserve them. It was then possible to find out their true condition – various drilled holes came to light with the filler and paint removed. Removal of the roof panels is relatively straightforward. The aluminium panels are nailed to the frame with ½” or ¾” panel pins. Nail removal is a matter of patience and persistence. A pair of electricians pliers is useful for this, with the under-face ground to remove the bevel at the cutting edges, and leaving them flush to grip nails heads more easily. Pincers and chisels also come into service. Where pins are too difficult to remove it is better to nail them through the panel using a nail punch. 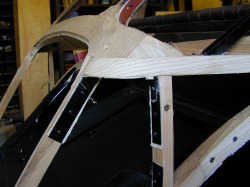 The most difficult part is to ease the main roof panel from around the rear window. I used tools to carefully lever the aluminium away to clear the opening. Some distortion is unavoidable, but at a later stage the aluminium can be annealed to soft condition and reinstated successfully. I will not detail every part replaced, but the annotated pictures show before and after stages, with notes and tips. Ideally individual frame components are removed, copied and replaced one at a time, to maintain the integrity of the body shape. In practice adjacent components need to be replaced together so as to achieve perfect common joints. I was not always successful in making replacement parts correctly first time, so a small collection of ash rejects accumulated! This is inevitable where drawings of the original are not available. There was no predetermined start point for repairing the frame. I just started with the most accessible and vulnerable component and proceeded wherever this led. In this instance I started with the boot floor. 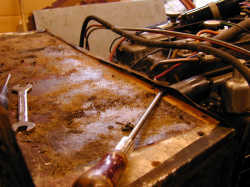 The ply resembled sponge from the extensive woodworm – so much so that I was able to lever the ply through the fixing screw heads and remove the screws after. The ply had just enough integrity to make a pattern for the new panel – and then hastily removed for disposal, after removal of the fittings. Similarly the ply fillet pieces at the tail end, each side of the boot were replaced. These were delaminated and wormy. 1. 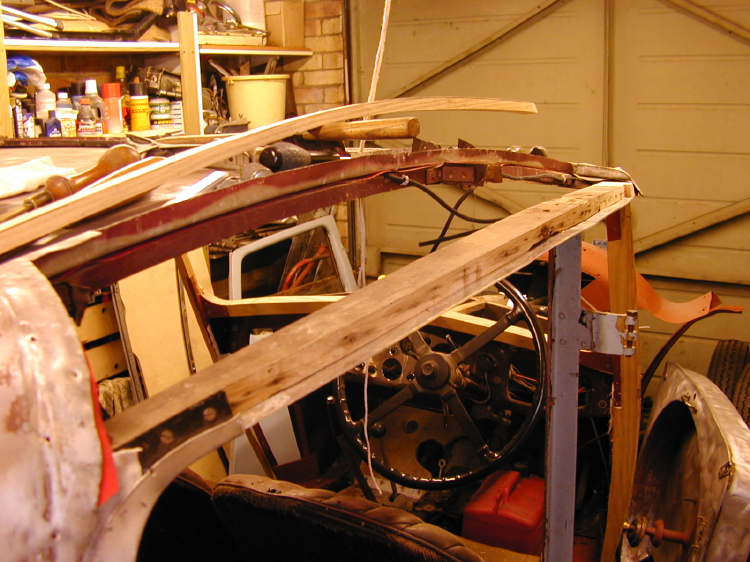 At the front ends jointed to the A posts and windscreen top rail, defective wood was cut away back to sound material and new timber jointed in, glued and screwed. 2. The outside face of the cant rails had a large number of nail ends remaining and timber was defective. Aluminium templates were screwed to the underside of the rails and profiled to follow the original line. These were removed and a 3/4" section along the length of the rail was cut away with a jig saw, then trued up with chisel and plane. The aluminium templates were refitted and new timber cut and formed (oversize) to follow the templates; these had to be cut to follow the two way curve of the rails as straight timbers could have distorted the overall shape. The new timber was then glued and screwed, then finished to follow the original line. This proved very satisfactory when it came to replace the original side roof panels and the new aluminium soffite peices. Incidentally the original frame showed evidence of error, with narrow timber make up peices nailed to the rail to true up the roofline over the doors! Most of the original steel plates and straps were reused, after acid pickling , priming and painting (- as described elsewhere on this website). A few plates which had corroded too far required replacement. A feature of the Riley ash frame body was the use of calico strips placed between all plates and timber and between all timber faces adjacent to metal panels. The calico appears to have been pre-treated with something like thinned chassis black to stiffen it. Even the bulkhead toolbox shelf was carefully lined round the edges with this calico tape. I have repeated this use of calico in the rebuild. The material was stiffened with ironed on spray starch for easier cutting into strips, and held in place with thinned adhesive. 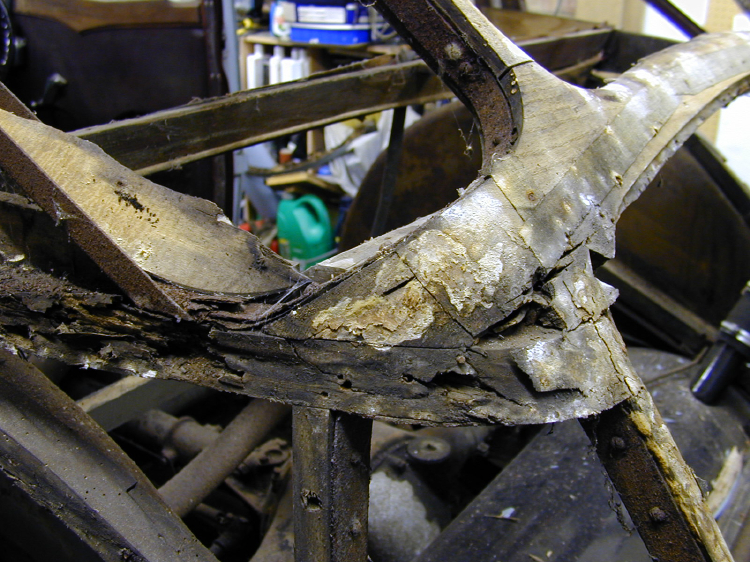 On this car the doors were in good overall shape, but there was local wet rot to some timbers. These were mainly the horizontal rails below the side screen openings and the bottom rails - all subject to most water penetration. It would have been very difficult to reinstate doorskins if they had to be removed, so I carried out just minimum repairs. The aluminium was turned back where it was dressed over defective timber just enough to allow repairs to proceed. Removal of defective timber was made easier using a Dremel tool fitted with milling cutters. The Dremel type tool is perhaps underated for this type of work, but I have found it very effective and controllable. Where new timber was pieced into existing I used external quality resin powder glue - Cascamite also known as Expamite, which is mixed with water. 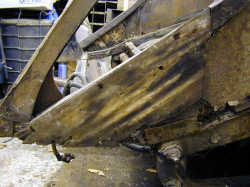 The use of solid ash in the body frames no doubt reflected common practice in the industry at the time. It was resiliant in service, easy to work and probably cheap to buy. The life expectancy for these bodies was probably not a priority for the makers, so the relatively poor durability of ash does not seem to have been a consideration. Small wonder that after more than seventy years most original bodies show the sort of deterioration illustrated in this example. Notwithstanding, I liberally washed the framework, new and retained original, with a timber preservative before refitting the panels. 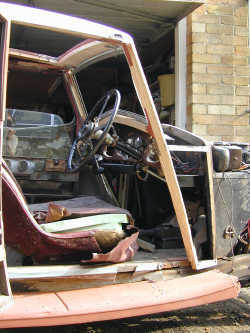 b) the tail and boot section including the timbers over the wheel arch, the C posts, the steel inner wheel arch, rear window and most of the rear roof components. This left the longitudinal members to be incorporated on the assembly line - chassis plate, B posts, cant rails and front to back rails each side of the sunshine roof. Other timbers and blockings were also added, literally 'built up'. My evidence for this is in the way the different components were jointed, and some instances where screws could not be fixed unless overlapping components were fixed after. The sub-assemblies were similarly built up in a sequence, no doubt on jigs. An example proving this is the boot floor, which is screwed to the framing running over the chassis. 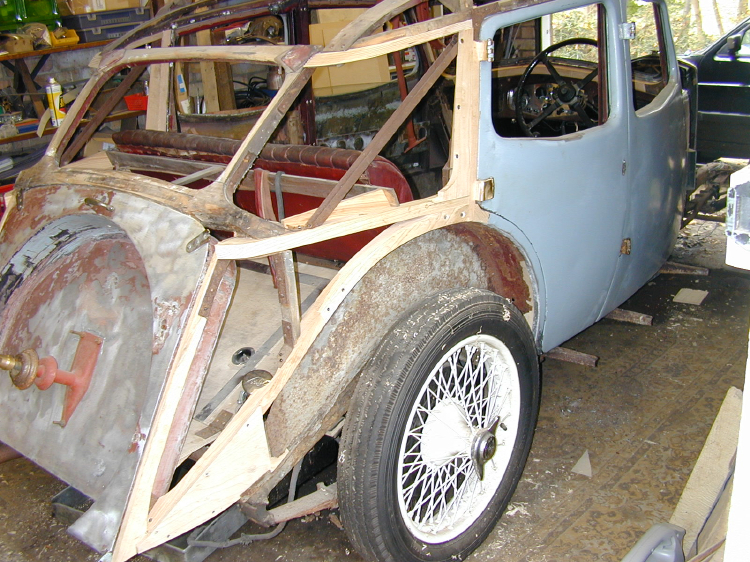 The original screws were fixed in at a slight angle from the outside, which would only be possible if the steel wheel arches were fixed after. The chassis plate is a vital datum reference which I am sure was made and drilled on a jig to ensure the door opening dimensions were correct. Nearly all the frame construction is dry jointed - that is with no glue. 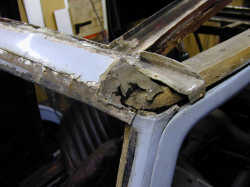 The only positions where I have encountered glued joints is in the boot lid frame and possibly in parts of the doors. The glue used was 'animal glue' which is not very resistant to moisture so would not have contributed much to the strength of the frame. There is also the consideration that this 1934 car was built only three years after Rileys were still building Weymann system bodies under license. This system was designed specifically to allow body flexing to accommodate the road conditions and car construction of the time. So it should not be suprising if this philosophy persisted. Similarly I wonder if the use of calico to separate timber and metal, partly to reduce squeaking, was a development of the brown paper wrapped round metal in the Weymann bodies. The original frame members are painted with a brownish black paint/wash on all visible faces, together with adjacent inner surfaces of aluminium panels. When the panels were removed it was noted that the paint did not extend over the meeting face of framing. It is not difficult to conclude that after the frame was assembled and panelled it was sprayed internally on all visible faces. There was no evidence of primer. The doors were similarly painted inside. They were also fitted with sound deadening pads comprising coarse brown compressible hair wadding about ½" thick, positioned between the mid rail and the doorskin, and kept in place with 'animal glue'. This material was also used, in the same way, inside the toolbox. The only question remaining is the composition of the paint used, though I think it was chassis black. Body number - one of the pictures above shows a timber, located on the nearside bulkhead adjacent to the A post, with the body number stamped into it. The number was also found on the driver's side of the ply panel behind the tool box, written in pencil. Some photographs of the car are shown below with the panelling refixed. Latest news - more photographs showing the bodywork painted.